Church Island on Lough Beg, which is really a wide part of the Lower Bann River, has the ruin of an old church complete with a spire which was added later by the Earl of Bristol (Bishop of Derry, also known as Bishop Hervey) around 1788. He desired to see the location of the ruins better from a grand palace which he also built on the grounds of what is now 'Ballyscullion House'. This palace which cost £100,000 to build was started in 1787 and almost finished in 1805. It was reputed to have had the best Italian marble and notably 365 windows. Later, when it transferred to his nephew on the Bishop's death in 1803, the government of the day reputedly applied a punitive window tax and the 'palace' was demolished in 1813 after standing for only some 8 years! Much of the rubble was re-cycled to build the present day 'Ballyscullion House'. Some palace remains can still be found in the woods and were recently used as a film set for the "Game of Thrones" series. Interestingly, the portico was carefully dismantled, ferried by barge and re-built in Belfast as the entrance to St George's Church. The spire on Church Island is known locally as Hervey’s Folly. During World War II an American aircraft based at the nearby Creagh air-base hit it with its wing tip and put a pronounced kink in it. It has since been partially straightened by the Department of the Environment who now look after it. Around the wall-steads is an old cemetery containing about fifty known graves, and the site of the ancient monastery which St Patrick is credited with establishing in the 5th century.. 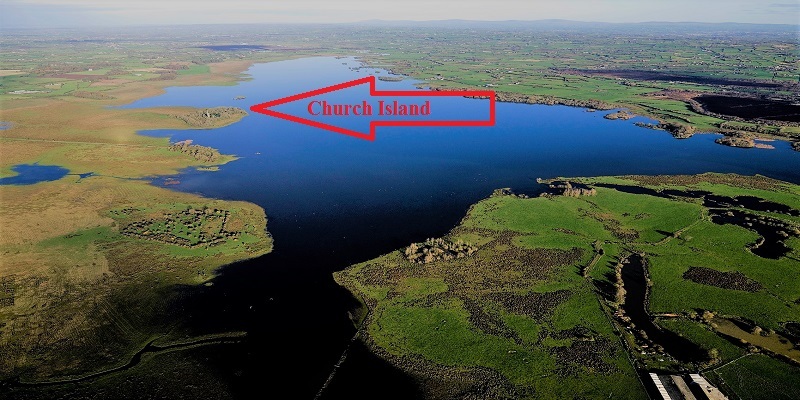 It is known that the old Church was in ruins by the year 1603 having apparently been burned down during the ‘Plantation’ period and that in the year of 1798 during the Rebellion, many women and children were forced to take shelter on this and other islands of Lough Beg. Visitors can walk in the summer months across the water meadows to the island from the County Londonderry side. Church Island is not an 'island' as such, insofar that only its eastern flank is adjoined by water. After the dredging of the River Bann in the 1940s, the water on the west side of the island receded - although after really bad weather the swollen waters again completely surround the place. The water meadows known as ‘The Strand’ stretch to over 300 acres and are alive with bird some of which reside here permanently and some of which migrate in from other parts of the northern hemisphere. Birds such as snipe, redshank, peewit, mixed with black-tailed godwit, green sand piper, wood sandpiper, greenshank and knot. Thousands of geese and ducks fly in during the winter from Russia and other northern sources to take advantage of the excellent feeding available. Many rare plants including Pennyroyal and the Irish Ladies' Tresses orchid share this habitat with the birds.